sweaty back, hot sun, and now some pain in my feet. Impatiently I wait as she warms up her pipes. Onlookers look on, judge and jury of this trial. One more try – there she goes, now she’s singing just right. Say my red-faced goodbyes and move on bule-style. my bike and my belly both let out low groans. I’m passing endless houses but could any be my home? Odometer’s broken so I can’t check my speed. Should I stop and smell the durian or just ride on? on this road I’m dodging traffic flow and pylons. busy questioning the question of my purpose. the cat and the fiddle play tunes I can follow. the shine of moonlight makes the street seem less hollow. as faces to which I am pained to say ‘goodbye’. Now stern stares turn to wide smiles that ignite no fear. I watch the faded moon fall gently behind me. a thousand lips resounding one “Selamat pagi”. 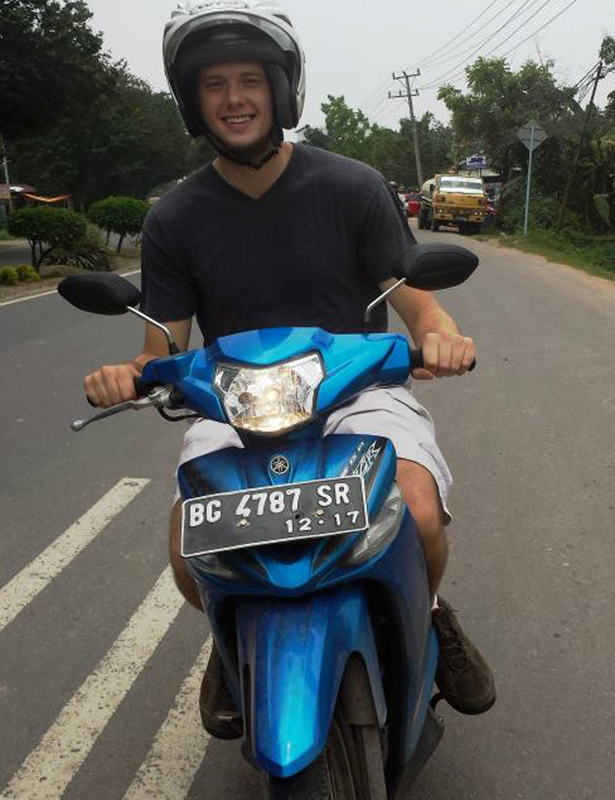 About the author: Matthew Moynihan is a Fulbright English Teaching Assistant at SMA Negeri 5 in Palembang, South Sumatra. He graduated from the University of Illinois at Urbana-Champaign in 2013 with a degree in Molecular and Cellular Biology. He has been greatly impacted by the Indonesian cultural phenomenon known as ‘Keep Smile’.